Airfare deals are typically only available on limited dates. We recommend that you use Google Flights to find dates to fly, then book through an online travel agency, such as Orbitz, which allows you to cancel flights without penalty by 11pm Eastern Time within one day of booking. Remember: Fares may disappear quickly, so book right away and take advantage of Orbitz’s courtesy cancellation if you’re unable to travel. No, it’s no $149 round-trip to Los Angeles (which is still available, by the way), but considering how far you’ll get to fly on the cheap, AA’s latest sale to Rio is an excellent deal. You can fly from Boston, Dallas, Miami or New York to Rio for less than $600 round-trip — the Miami and New York flights are nonstop, and you can find quick connections from Boston and Dallas. You can also begin your trip in Los Angeles for $635, including a flight to JFK on AA’s new A321. Depending on your origin, flights are available at these prices through the end of May 2016. Dallas to Rio for $562 on AA. 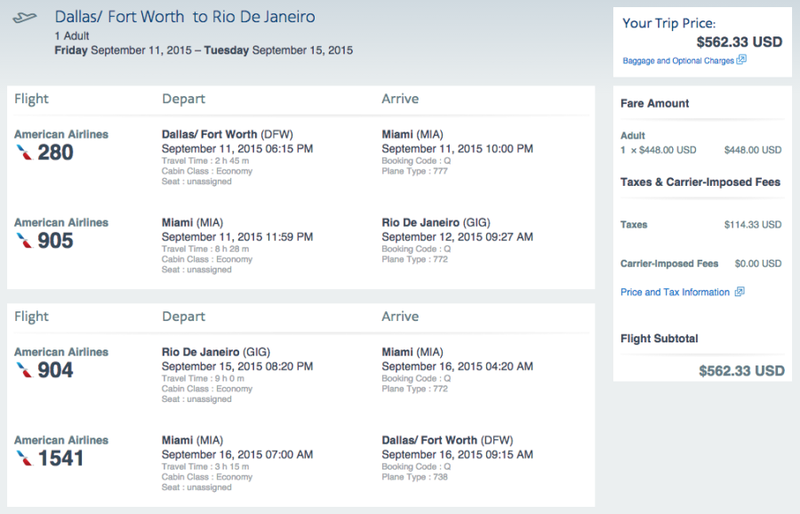 Miami to Rio for $568 on AA. New York to Rio for $582 on AA. 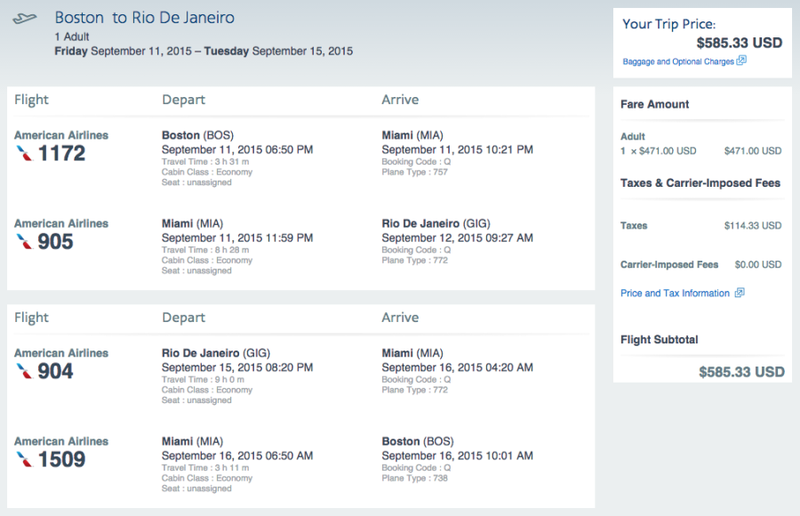 Boston to Rio for $585 on AA. Don’t forget to use a credit card that earns additional points on airfare purchases, such as the American Express Premier Rewards Gold or Citi Prestige (3x on airfare) or the Chase Sapphire Preferred Card (2x on all travel purchases). Check out this post for more on maximizing airfare purchases. As a reminder, you’ll need a visa if you want to head down to Brazil, and for help with visas we recommend our friends at Allied Passport & Visa. For more on Rio, check out Destination Of The Week: Rio De Janeiro, Brazil. If you’re able to score one of these tickets, please share the good news in the comments below! Based on TPG’s most recent valuations, the 50,000 miles are worth $700. In addition, you can earn 10,000 Elite Qualifying Miles (EQMs) toward elite status after spending $40,000 in a calendar year. As of July 23, 2017 this is the only card that offers Admirals Club lounge access so if you are an AA flyer this card might make sense for you. Aside from lounge access the primary cardholder will receive a Global Entry application fee credit every 5 years, first checked bag free for up to 8 travel companions on domestic itineraries and a 25% discount on eligible in-flight purchases on American Airlines flights.